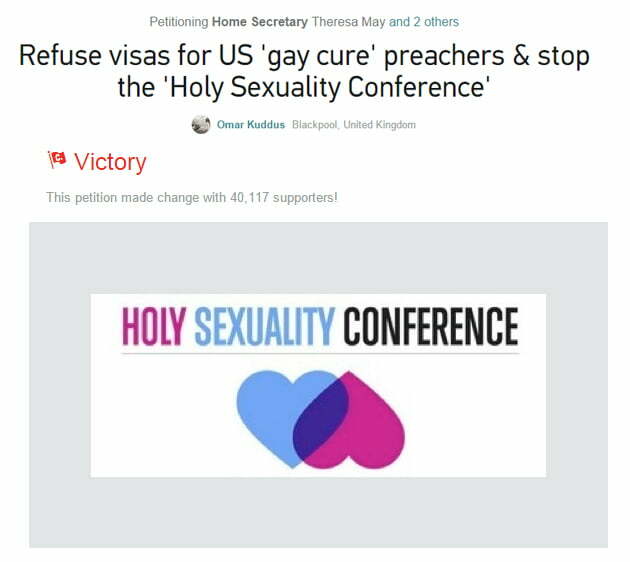 A gay conversion conference due to be held in London has been scrapped after a change.org petition received over 40,000 signatures calling for the government to refuse visas to the guest speakers and have the event cancelled. The ‘Holy Sexuality Conference’ was scheduled to be held over a five-day period and would see members of a Christian group and people claiming to have been cured of being gay help others ‘heal their sexuality’. The church holding the event planned to bring three speakers from the US (Mike Carducci, Danielle Harrison & Wayne Blakely) to share their experiences, beginning 21 April. Unsurprisingly, the event cause controversy and an on-line backlash followed, which then started the petition to cancel the event.